The last time I made lasagna completely from scratch (including the noodles) was over a year ago for the March 2009 Daring Bakers Challenge. I have hand rolled pasta my whole life. That’s not to say that I’ve been making LOTS of homemade pasta. 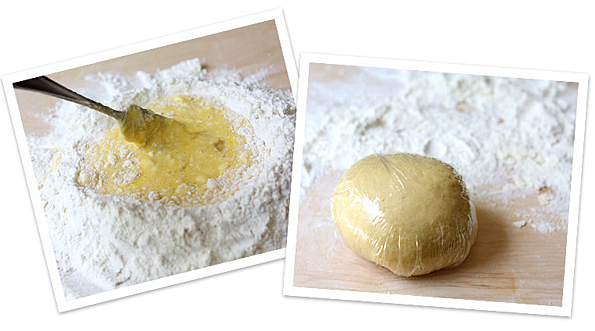 I have to admit that hand rolling my noodles has been a big deterrent in me making homemade pasta on a frequent basis. I find hand rolling tedious. 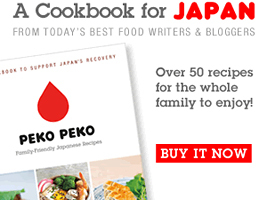 In fact lately the only time I ever do it is to make Mr. Fuji’s grandma’s recipe for noodles to go in chicken noodle soup. They are so good that I am extra motivated to spend the time and effort making them. I now no longer have any excuses, because last week I made lasagna from scratch using a pasta maker for the first time and it was EASY and heavenly! 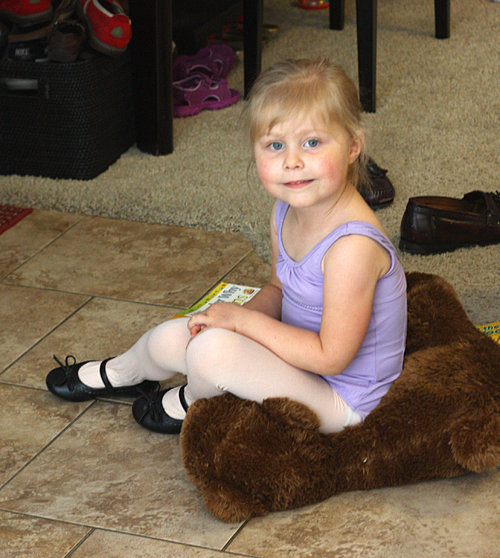 This past week Squirrel attended her first day of preschool and her first day of a dance class (ballet/tap/jazz). It was a big week for both her (and me! ), and so I decided it called for a celebration. Squirrel and I threw ourselves a pasta making party. We used a recipe for Spinach Goat Cheese Lasagna from Italian Food Forever. I figured I couldn’t go wrong with ingredients like spinach and goat cheese! 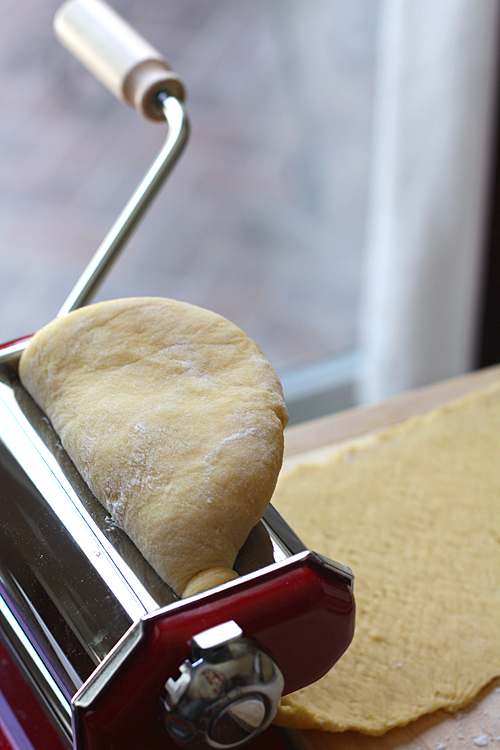 Making the dough was extremely easy—the instructions in the recipe were very approachable. I substituted 1/2 cup of semolina flour for 1/2 cup of the all-purpose flour, because Deborah writes that this gives the pasta more texture and firmness. As opposed to what I have experienced in the past, rolling out the dough was the best part of making this lasagna. Squirrel even got to help with this part and was very proud of her beautiful noodles. After we let the dough rest we ran it through the pasta machine, cut the strips, boiled them briefly, and then set them out to dry. Then we made the tomato sauce and started building the lasagna! The lasagna came out beautifully and was delicious. Definitely a great way to celebrate a big week! To Enter: Leave a comment here telling me what your favorite Italian dish is. The contest will end on Thursday, April 22, 2010 at 10pm PST. The winner will be announced on Friday, April 23, 2010. US Residents only please. The winner will be chosen using Random.org. If you need some lasagna inspiration, the third webisode Into The Heart Of Italy premiered last week: The Secrets of the Pollaio. In this webisode, Chef Rocco DiSpirito, Marisa Tomei and Dan Cortese track down Italy’s “Egg Man” and learn to cook a traditional rustic dinner. There is one particularly hilarious moment in this webisode. See if you can guess which one I’m talking about! 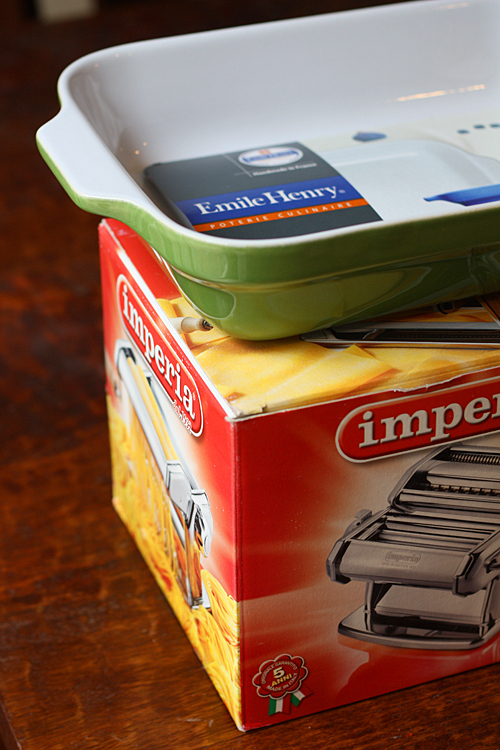 Disclosure: The nice folks at Bertolli sent me the same prize package as the winner will receive. Thanks Bertolli! It’s definitely lasagna. I love the layers and spinach with ricotta, yum! 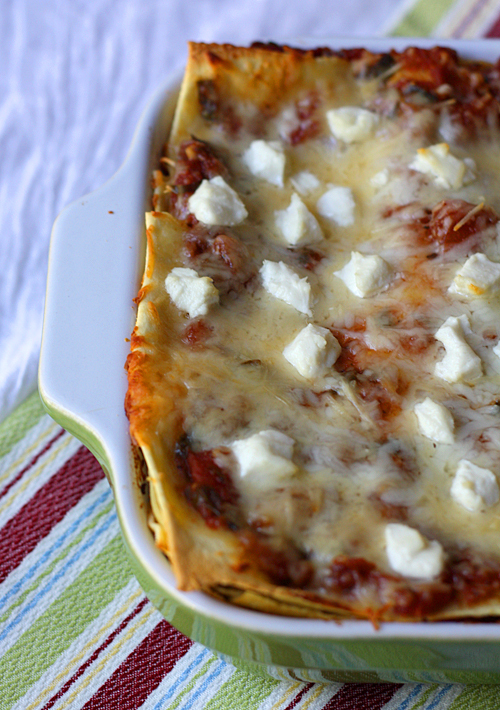 Mmmm…that spinach goat cheese lasagna looks awesome. Not sure about making my own homemade noodles though. They do taste 100x better…..hmmm…..can I find motivation? My favorite Italian dish is spaghetti bolognese. I just love that bolognese sauce. I haven’t really been able to make it as well as I feel like it could be. I guess I just need to keep trying! Thank you for having this great giveaway! 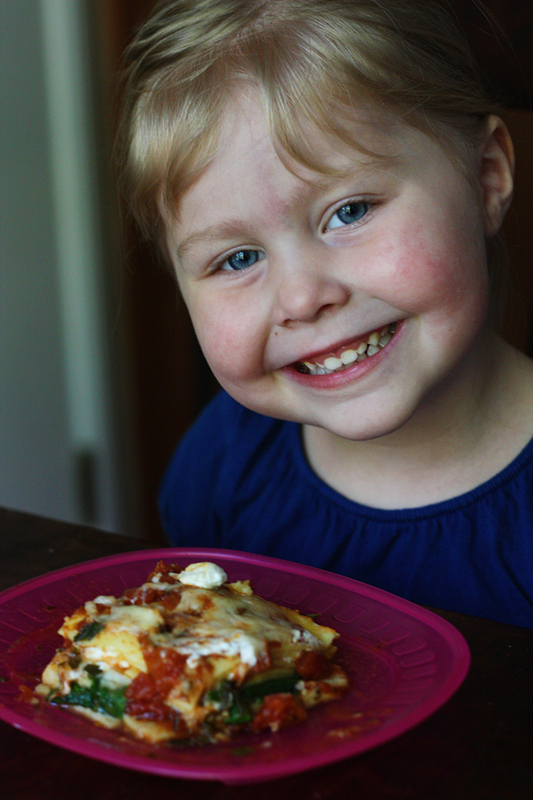 I love lasagna and pretty much any baked, cheesy pasta! I am obsessed with Italian food. It is hard for me to choose only ONE favorite, but I guess I would say classic lasagna. I can’t get enough. Anything pesto, but especially creamy pesto on angel hair pasta. Nom! I love goat cheese but I’ve never had it in lasagna. I bet it tastes delicious! Does fried calamari count? After that, I love a good chicken marsala. Italian food is my favorite!! I’ve never made homemade pasta, but would love to try sometime. My favorite dish is probably manicotti. 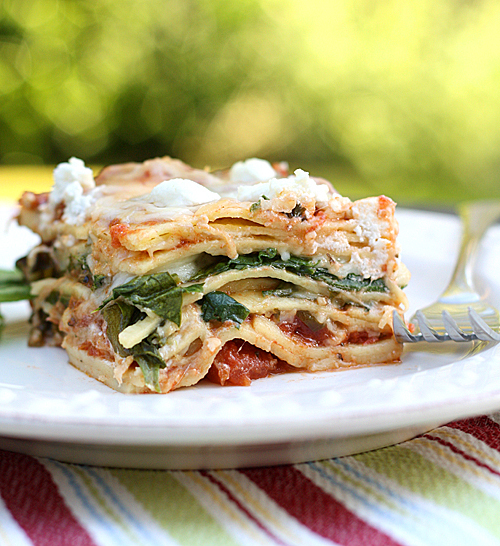 p.s.- your spinach lasagna looks ah-maz-ing! Agh! I LOVE these give-away’s. I am with you in not liking to hand roll my pasta, and I know that that often prevents me from having truely fresh and yummy dishes. Actually, I have to say that one of my favorite dishes is my grammy’s Chicken Cacciatore. It was always so good. But I have to say, I make a mean lasagna too. Ahh.. you have me day dreaming pasta dishes now. What a great giveaway! I love lasagna, and pizza, and spaghetti carbonara, and fettucine alfredo, and manicotti, and pesto on anything… the list goes on and on and on. ;) Thanks!!! I really do love a good lasagna! Oh my goodness, how can I even choose?!! 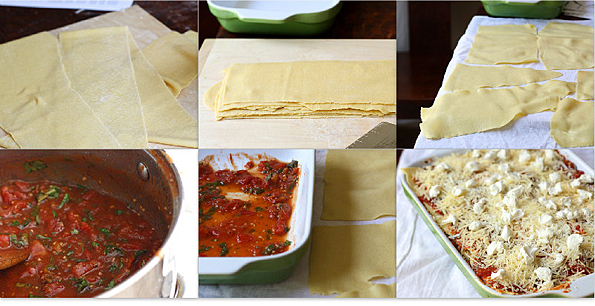 I love any homemade pasta– especially if it involves a ricotta cheese filling. And my brother spent a couple months in Italy and came home with a fantastic tomato sauce recipe. and Caprese salad with fresh mozzarella…. mmmmmm. I love to make homemade pasta, (even with a maker, I don’t do it often enough! ), but we usually make a very light fresh tomato sauce to go with and are done! My favorite is good ol’ fashioned spaghetti and meatballs! Lasagna comes 2nd. :) I’ve never made a lasagna from scratch though, I really must learn! My absolute favorite is spaghetti with marinara sauce. Homemade sauce only! My absolute favorite is spaghetti bolognese although lasagna is a close second best. I have not yet found the courage to attempt making my own pasta noodles, but your pictures are so inspiring! I make lasagna often and recently (at the request of the kids) made it with a side of sliced fresh tomatoes topped with mozzarella, drizzled in olive oil and balsamic vinegar and sprinkled with basil chiffonades. It was a simple side with delicious impact and the family was very impressed. I have a feeling if I win this contest and make homemade pasta, well… I just might make it to ‘super-hero’ status! Thank you for constantly inspiring me to think out side of the box and showing me that a little extra time in the preparations goes a long way. What a GREAT giveaway! I am a huge fan of good ole lasagna, YUM!! The one you made looks most delicious!!! Oh my! This is amazing. I have been wanting a pasta roller for so long! My favorite pasta is- almost any type. I love them all- especially when they are warm and gooey and baked with lots of cheese and tomato…yum yum! My favorite thing is meatballs. I could eat them all day! I don’t know why, but when I got married I got 2 of these pasta makers and, not seeing the big picture, returned them due to a small apartment size. I’m still kicking myself. My favorite is stuffed manicotti, but after looking at these pictures, my mouth is watering for lasgna! My favorite Italian dish is gnocchi…something about the fluffy, chewy goodness in yummy tomato sauce really gets me! Italian cooking is so yummy, but my favorite has to be gnocchi with vodka sauce! YUM! I love this gift, I have always wanted to try making my own pasta. WOW! I would kill for that pasta machine. Thoughts of murder aside…I’d have to say that my favorite dish is seafood puttanesca – just about any kind of seafood in a spicy sauce. YUM! I love gnocchi…with sage-butter sauce, it’s just so decandant and light…it’s perfect! I have an electric pasta maker and I just love it. Makes pasta making so easy and everything goes in the dishwasher so no too much clean up either. Squirrel is so cute in her leotard and tights! With so many great Italian dishes it’s hard to choose! Gnocchi di Zucca is definitely one of my favorites though. That looks delicious! My favorite is gnocchi, with just about any sauce! Getting Bucatini noodles really is what makes this recipe so special to me (I just love the shape for some reason!! 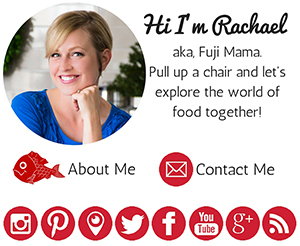 ), but the sauce is darn good, too!! There’s also a restaurant in downtown Santa Barbara called ‘Bucatini’ which is actually the first place I ever experienced these fabulous noodles. They have great food, too! I have a fabulous lasagna recipe that is probably my favorite pasta dish. 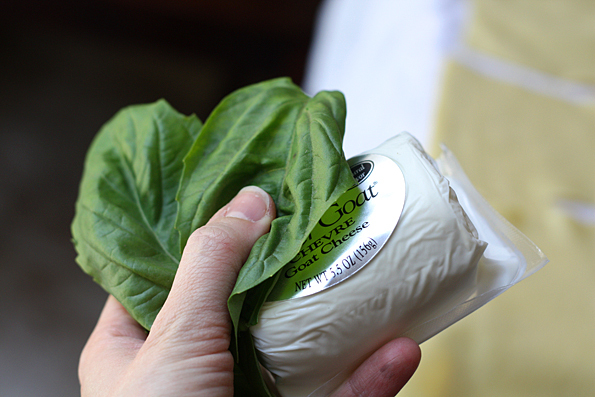 love your absolute fab lasagna……with our family’s fav ingredients like spinach and goat cheese! That recipe looks fabulous! I love the pictures of squirrel; she definitely seems to be enjoying it!! :-) As for my favorite pasta dish, I’d have to go with lasagna. 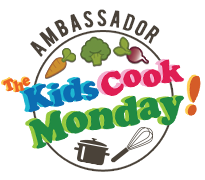 Though a great spaghetti with meatballs (topped with asiago cheese) would be second! Eggplant Parmesan is my favorite! Thanks for the opportunity to win the awesome prizes! I love how you involve Squirrel with all aspects of cooking. My favorite Italian dish is rice balls. Now that my MIL is gone, the only way we get them is if we make them…which isn’t even once a year. yum! the lasagna looks amazing! But I gotta love shrimp angel hair pasta! I have a few favorites. I like chicken pasta with vodka sauce, Lasagna (of course), baked ziti, and a restaurant in town has a dish called “Spasagna” which has the flavors of lasagna but with Spaghetti noodles. 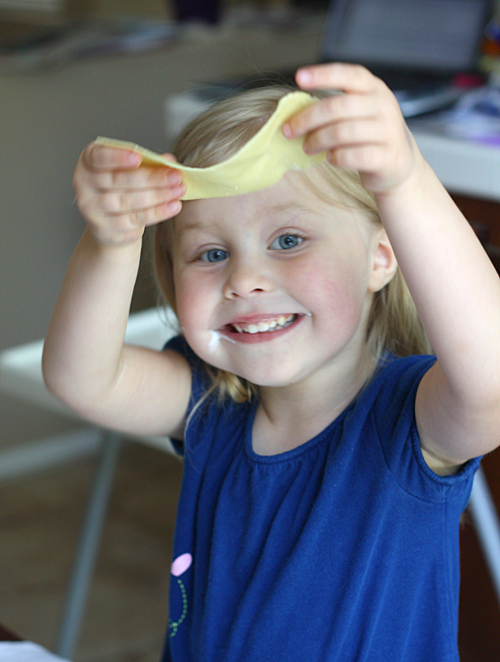 I’ve never made homemade pasta, but it looks fun! It looks like something my three year old daughter would enjoy!